I really appreciate whoever came up with "quilting and collecting fabric are two different hobbies." While I actually have a very usable stash for the type of quilting that I generally do, I have been collecting Halloween fabric for quite a few years. And every year October 1st rolls around and I wish I had a Halloween quilt. Then I very accurately realize there's just not a high likelihood that I could start and finish a Halloween quilt before Halloween. You've heard of Christmas in July, right? Many crafters who make handmade gifts begin making those items in the summer. Last year, I decided that if Christmas in July was a thing, so was Halloween in April... and I marked my calendar for April 1st of this year to start my Halloween quilt. Surely, if I began a quilt in April could have it done by October. April came and went and I finally started the quilt in May. I chose the Strip It Down pattern by Quilt Theory. It's a great pattern that could easily go together in a day, except of course that I work on many projects at once and I had to order my background fabric. I had a finished quilt top by the beginning of September, so I selected the backing fabric (which I didn't photograph, but you'll have to take my word is an awesome purple polka dot on black) and sent the quilt to Tami for longarm quilting. I chose a computerized spider web panto that I'd seen her use on another quilt, and a variegated orange thread. I'm thrilled with how her quilting jazzed up my quilt. The large panels in each strip are a great place to feature fun prints and there are no seams to match up. The background panels are great for a solid fabric to feature an interesting quilting motif or a nice patterned fabric. I'm a firm believer in using a striped binding whenever reasonable and I'm happy I went with this black and white stripe. It made me a little dizzy to look at the yardage, but these skinny little strips are just perfect! You can see my goal in this post. Linking up to OMG October Finish Link-Up and TGIFF at Anja Quilts. I've also linked up to the 2017 Q4 Finish Along link up. See my whole Q4 list here. Posted in Quilting. 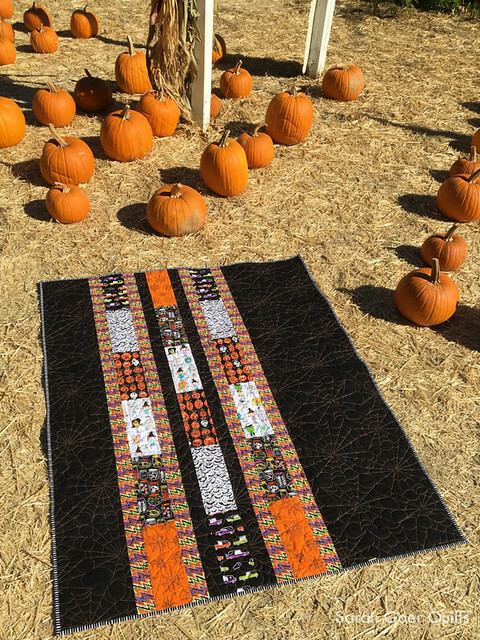 Tags: finished quilt, Halloween quilt, lap quilt, Quilt Theory pattern on October 26, 2017 by sarah. It's awesome. The quilting is amazing. Well done for starting early. Fantastic! Definitely this can stay out until your Thanksgiving at least. It just might! Thank you, Lisa. The quilt looks wonderful and what a fun photo location. Thanks for linking up with Elm Street Quilts One Monthly Goal and congrats on your finish. Multitasking for the win! We took some photos and picked up a couple pumpkins for carving. :-) Thanks for hosting OMG! What a Fun Quilt! The Spider Web Quilting is Fantastic! 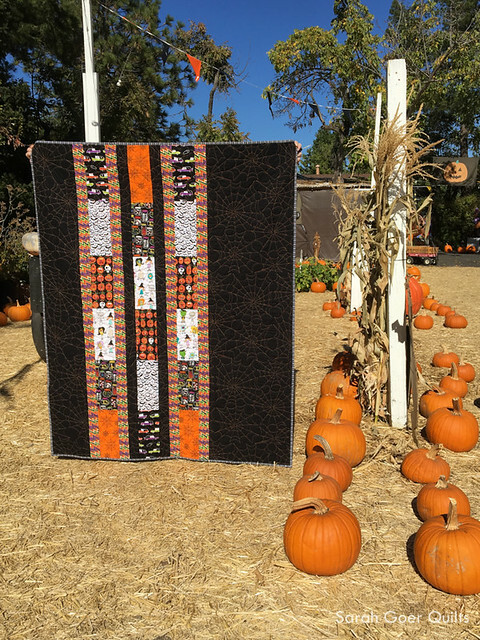 That spider web quilting is what I really wanted on my Halloween quilt. Maybe the next one. Ha! 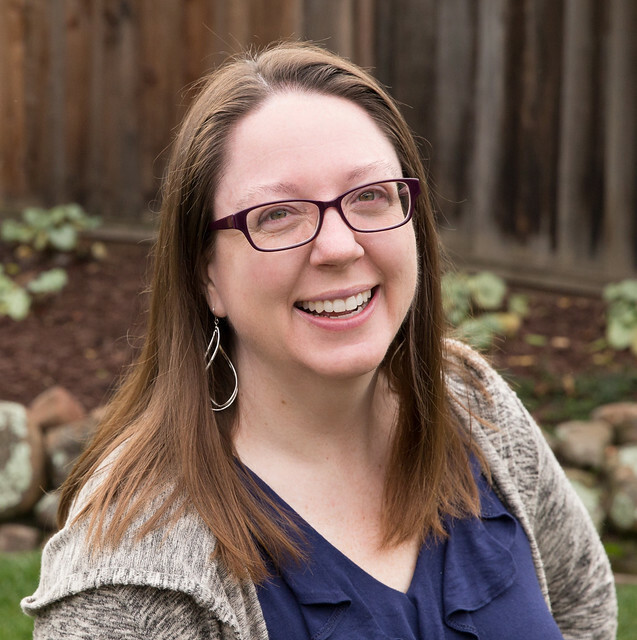 Nice work on getting it done and blogged before Halloween. Wow, I love this quilt! The fabrics are wonderful and showcase well with this design. 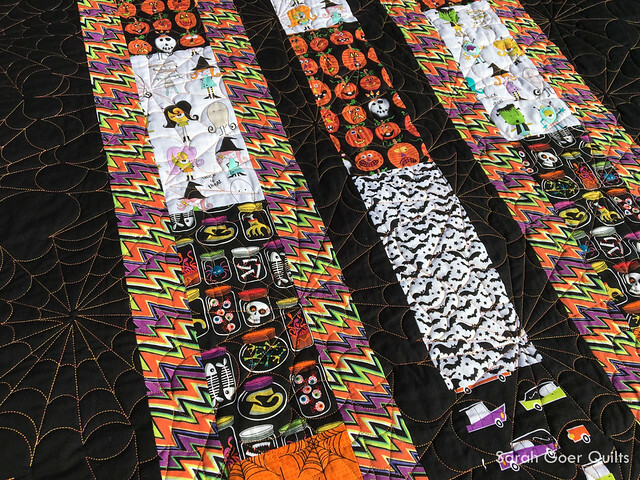 I have much more Halloween in my stash and now have a great quilt pattern to scoop up and get to work. Thank you for the inspiration. This version of Strip it Down is awesome! 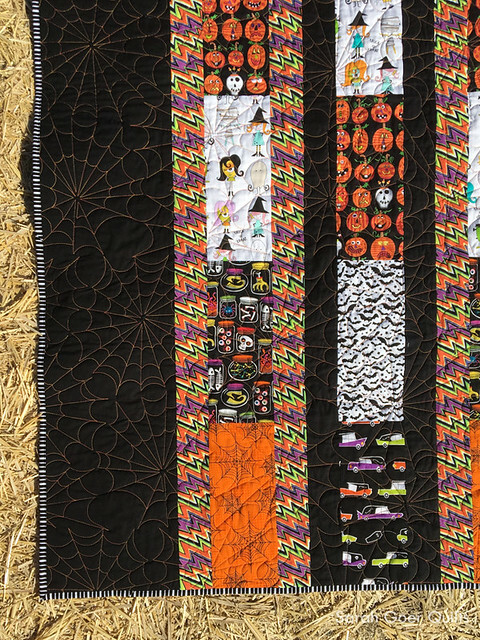 I love the Halloween prints and the spiderweb quilting. What a great quilt Sarah - Halloween in April did make laugh! The quilting is fantastic. Thank you for taking part in the FAL - from the FAL hosts. Thank you! Halloween in April is the only reason it got done. Many projects move very slowly around here. ;-) Thanks for hosting!